The 10GA celebration ceremony on the last day saw the delegates honour and fete the eye care talent IAPB members nurture and partner with. As the fifteen Eye Health Heroes of 2016 in attendance walked up to the raised stage, they received a standing ovation from the audience and the applause lasted a long time. The Eye Health Heroes initiative recognizes and celebrates frontline staff whose work in the field and engagement with the community makes a real difference in restoring sight. They are nominated by IAPB member organisations from within their ranks, or from their partner organisations. Charlotte Bonnet of the L’OCCITANE Foundation honoured the heroes by presenting them with certificates along with a bagful of L’OCCITANE products. 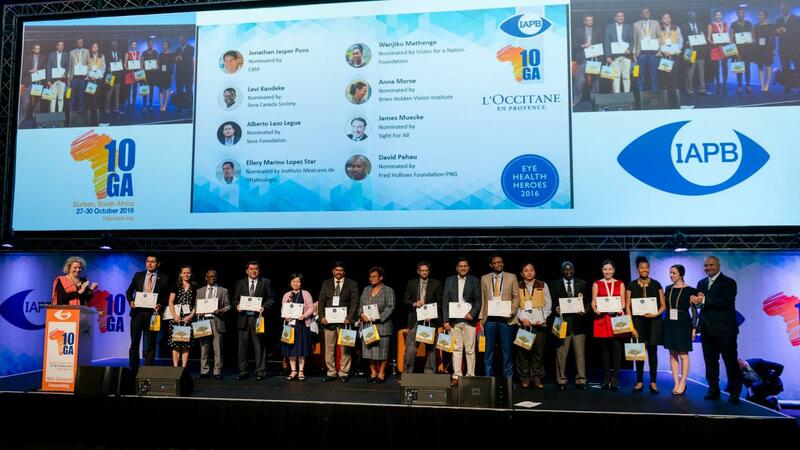 The L’OCCITANE Foundation has supported the initiative since its inception. The Foundation also extended travel support to two heroes: Jambi Garap and Wanjiku ‘Ciku’ Mathenge. Jambi Garap is a relentless advocate within the government and health sector in developing sustainable eye care systems within Papua New Guinea. While Ciku, a leader in eye care in Africa, designed and developed an innovative PEC training course for Rwanda’s primary health care nurses. Be it Anna Morse who develops and manages eye health training programmes for Aboriginal health care workers or César Gonzales who was instrumental in the creation of the first National Plan for the Prevention of Blindness in Peru, all of the twenty four heroes are leaders in their field and have made a difference to eye care delivery in their countries. The short ceremony was one of the highlights of the celebration ceremony. The heroes in attendance at the event were: Anna Morse, Alberto Lazo Legua, Boateng Wiafe, César Gonzales, Chunhong Guan, Jachin D W Aruldoss, Jambi Garap, Janak M Shah, Khairul Islam, Levi Kandeke, Lobsang Tsetim, Mama Tapo, Vanessa Bosch, Wanjiku Mathenge and Zhou Xing-Tao.